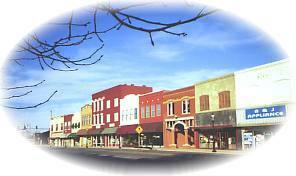 This is historic Enid, Oklahoma - the hub of Northwest Oklahoma since its overnight development in the 1893 Land Run. It's the Bright Star of the Great Plains. It is a town said to have been named by a railroad official after a character in Tennyson's "The Idylls of the King," who felt that Geraint's wife, Enid, should be honored by having a city named for her. Other sources say that a group of cattle drivers who stopped in Government Springs Park to eat turned the "DINE" sign on the cook tent upside down! It took the first settlers only a short time to discover that two Enid townsites had been plotted. These two townsites were only three miles apart and therefore a struggle between the north and south towns began. At the turn of the century, easy access to a railroad was an absolute must if a community was to grow and prosper. The Rock Island Railroad had put its depot at North Enid, even though Enid established the post office and was designated as "the government town," by surveyors of the land rush. The railroad stopped in North Enid rather than Enid, and a battle ensued. Then one night, persons, still unknown, sawed through the supports on a Rock Island railroad trestle southeast of Enid, and the nest train was dumped into the gully. A short time later the railroad agreed to move its depot to Enid. Good times followed. From the standpoint of attractions and fun things to do, Enid has much to offer both the traveler and the resident. The Museum of the Cherokee Strip offers unique insight into the history of the area; the Railroad Museum of Oklahoma is a must-see for railroad buffs and historians; George's Auto Museum features outstandingly-refurbished relics of motor history; Midgley Museum offers both unique architecture and a collection of interesting artifacts, and Bartunek's Winery offers wine from grapes grown in Oklahoma. The recently restored Government Springs Park features Humphrey Heritage Village. Leonardo's Discovery Warehouse and Adventure Quest have exhibits in the arts and sciences and hands-on programs for both children and adults. Recreational opportunities include parks where you can take a ride on the train, play tennis, picnic, or relax by the lake, and three golf course for championship challenges. Enid currently has a population of approximately 47,000 citizens proud of their progressive city, their cultural centers, their nationally recognized Vance Air Force Base, and the huge elevators that have long been Enid landmarks reflecting the city's agricultural roots. If you are fascinated by trains, you will like the Railroad Museum of Oklahoma. Within the museum compound, there are six cabooses from railroads that have served Enid (Union Pacific, BNSF, Grain Belt), a baggage car, motor cars, a three-dome tank car, and a 50-ton engine. Helen Mary Walker Garriott and Dr. Owen K. Garriott, astronaut, wanted to give back to their childhood community. They gave the seed money to launch "Leonardos." At the Midgley Museum, you can view an eclectic assortment of objects and artifacts collected over a lifetime of rock collecting by Mr. and Mrs. Dan Midgley. Gem and mineral enthusiasts will enjoy the array.